Ross County and Inverness Caledonian Thistle still face a 'Highlands stigma' despite their recent success, says ex-manager of both clubs John Robertson. The Hearts legend led Caley Thistle into the Scottish top flight in 2004 and also had a short spell at County. Inverness have finished in the top five for three years running while Staggies are fourth and in the League Cup final. "People have this stigma about the Highlands as a footballing outpost; it is not," Robertson told BBC Scotland. "There are a lot of good players up here. Both clubs deserve tremendous credit for the work they have done over the last four or five years." As well as their highest-ever league finish of third last season, Inverness won the Scottish Cup for the first time, a year after reaching their first League Cup final in 2014. 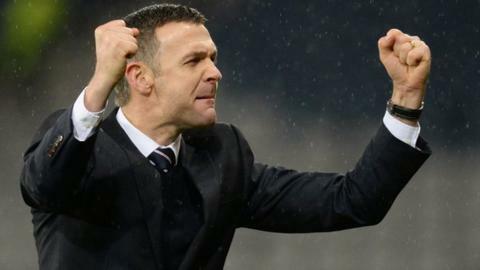 After promotion in 2012, Ross County have finished fifth, seventh and ninth, but currently lie fourth in the Premiership ahead of Wednesday's visit of third-placed Hearts. The Staggies have also have a League Cup final against Hibernian on the horizon after beating Celtic in the last four, and a home Scottish Cup quarter-final against Dundee United. "People still seem surprised," Robertson said. "We have been saying for years the talent was up here. The Highland clubs have made tremendous progress. They are both really well run and both have quality players. "Inverness have been hamstrung by injuries this year but they are still going well in the Scottish Cup and will fancy their chances of retaining that [Caley are away to Hearts or Hibs in the last eight]. "Everything is going fantastically well at Dingwall at the moment. County have rarely been out of the top six. "They have been well backed by the chairman, spent really well and have just added a bit more quality and experience with David Goodwillie to bolster their attacking options. "They are in the League Cup final and have a wonderful chance of reaching at least the semi-finals of the Scottish Cup."